It used to be that one of the big draws of The Walking Dead was that characters would die unexpectedly without any kind of advanced warning. It gave the show a seat-of-the-pants, anything can happen feel that was both attractive and scary. 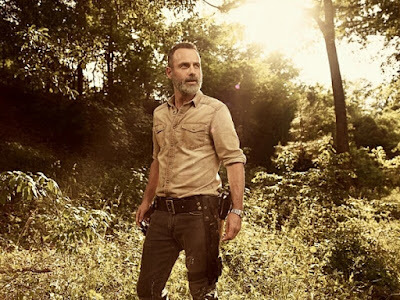 However, all of that has changed with season nine, because we seem to know exactly who is leaving, and in the case of Andrew Lincoln's Rick Grimes it's even become part of the marketing strategy. Perhaps it's a ploy to lure back some of the fans who peeled off in recent seasons, but AMC is using Lincoln's final season as a key part of this brand new trailer. "Rick Grimes' Final Episodes" are going to feature a lot of jumping around through time, presumably to hide the full nature of his exit, but the point is he's going to be gone and I hope that's not the only thing creatively this season has going for it. Hopefully there are other ideas for this season beyond writing off Rick. I'm not so sure. The Walking Dead returns to AMC on October 7th at 9pm EST.